Happy February gang! I honestly can’t believe how quickly the first month of 2018 flew past, and to be honest it’s actually a little terrifying how fast time is passing recently. Anywho, I thought I would share with you a slightly different post today to try and inspire some motivation for the new month, because I don’t know about you, but I’m definitely experiencing a case of the winter blues at the moment and pining for warm weather and summer holidays (hurry up bare leg season please!). Speaking of which,I recently tweeted about the niggling feeling I have that my youth is going far too quickly without me really having time to enjoy it and do everything I so desperately dreamed of in my early teens when I envisioned being 20. I was thinking of sharing a post detailing the plans I’ve made to look forward to this year and how I’m challenging my anxiety to achieve as much as I possibly can- I’d love to know if this is something you lovely lot would be interested in reading! Anyway, I digress! This post is all about the music that I’ve been loving over the past month and the throwback tunes that inspire me to feel good and positive on the daily! Whether it’s on my morning commute or when I need a 3pm pick-me-up, these songs never fail to leave me feeling happier and in a better mindset, both for work but also simply for my mental health. I think music is often underestimated in the impact it can have, but I know for me personally, it can absolutely transform my mood and is one of my number one go-tos when I’m having a bad mental health day. 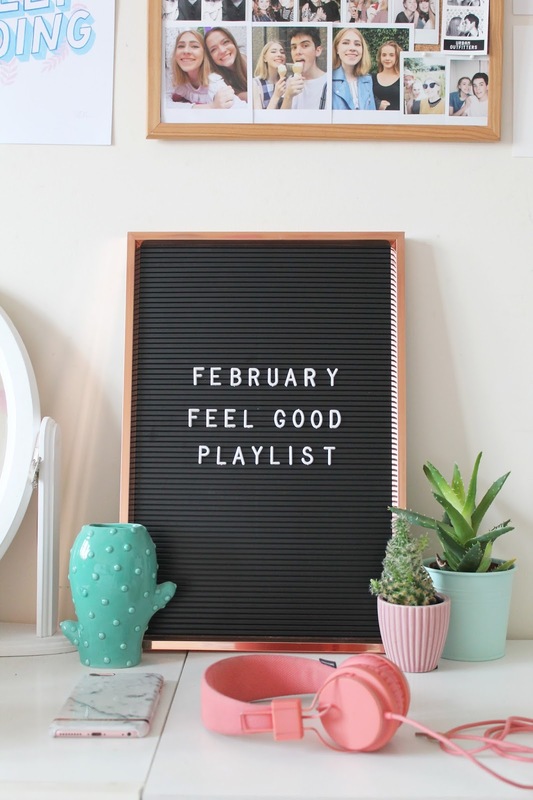 I’m extremely fond of a good ol’ throwback tune so this is the main focus of this playlist, however there’s also some of my more recent faves to mix it up a little and ensure I have an option for every mood! Music is a hugely personal thing and so you may have an entirely different feel to your positivity playlists, but I hope either way this post has reminded you of a few of your fave throwbacks that you totally forgot existed, or simply curated a selection of songs you listen to regularly all in one place! Be sure to let me know your favourite feel good songs and lets share the good vibezzz this February!